We have compiled a list of the best fitness trackers and smartwatches launched and tested in the year 2018. Have a look. IDC said overall India wearables market saw a 17 percent year-over-year (YoY) growth in the third quarter of the year as vendors shipped a total of 897,000 units in the country. However, the overall shipments declined 11 percent from the previous quarter largely because of the double-digit decline in the basic wearables. So today in this article we will be highlighting the top wearables of 2018 which have been received well by the audience. Xiaomi tops the chart when it comes to the wearables segment and its recently launched Xiaomi Mi Band 3 became the most shipped wearable product ever in the history of India. This is the fourth Mi fitness band of the company after Mi Band, Mi Band 2 and Mi Band HRX Edition. The Mi Band 3 comes with 0.78-inch OLED touchscreen curved display and it is significantly bigger than Mi Band 2. It has a 110mAh battery which is 60 percent larger than its predecessor and according to a company claims it provides up to 20 days of battery life. The Band supports Bluetooth 4.2 BLE. It's certified for water resistance up to approximately 50 meters. The newly launched band is available in three colors such as Black, Blue, and Red. The Band is priced at Rs 1,999 and it is exclusively available on Amazon. The second band in our list is Honor Band 4 which comes with a large 2.5D curved screen, which is a 0.95- inch AMOLED 240x120-colour display with full touchscreen. The Band features 6-axis sensor which automatically recognizes swim strokes, records swimming speed, distance and calories. Furthermore, the Band 4 is swim-safe and is water-resistant up to 50 meters. The Honor Band 4 is backed by HUAWEI TruSeenTM 3.0 heart rate technology can continuously monitor heart rate 24 hours real-time continuously, capture night infrared heart rate monitoring and even share heart rate warnings. The Band is priced at Rs. 2599 and it is exclusively available on Amazon.in. Samsung unveiled one-of-the best smartwatch this year in the form of Galaxy Watch. It comes in two variants - 46mm case in silver with a contrasting matte black bezel and a 42mm option in full body midnight black and Rose gold. In fact, users can customize Galaxy Watch with a massive selection of watch faces and straps that can be purchased at regular watch stores. In addition, Galaxy Watch's certified military-level durability with Corning Gorilla Glass DX+ and industry-leading water resistance with a 5 ATM rating allows for long-lasting use, no matter the environment. We have tested the standard variant of Galaxy Watch and we loved the fluid UI and the signature rotating dial. The smartwatch sports a 1.3-inch display and 1.2 inches along with Circular Super AMOLED panel (360 x 360). The display is very responsive and bright. The watch screen can display all your notifications and even allow you to respond to texts via typing and voice commands. It also has a built-in speaker to activate voice messaging and music listening, and GPS as well. Overall, Galaxy Watch is quite a good-looking smart computer on your wrist. Smartron, India's first OEM and IoT brand has also launched tband with first of its kind features such as ECG (Electrocardiography) and BP (Blood Pressure) monitoring to measure a Unique Fatigue & Stress Factor. Apart from ECG and BP monitoring features, tband comes with the ability to continuously measure heart rate as well as resting heart rate. Along with basic fitness parameters such as calorie burn, steps, and running distance, with sleep tracking, the tband highlights sleep patterns and efficiency. It also helps the user throughout his/her day with customizable alerts for waking up and medicine reminders, DnD option, inactive and SOS alerts, SMS and call notifications. The tband is available on Flipkart at Rs. 4,999. The US-based luxury watchmaker Fossil Group recently unveiled a total of seven new smartwatches across its six brands in India. 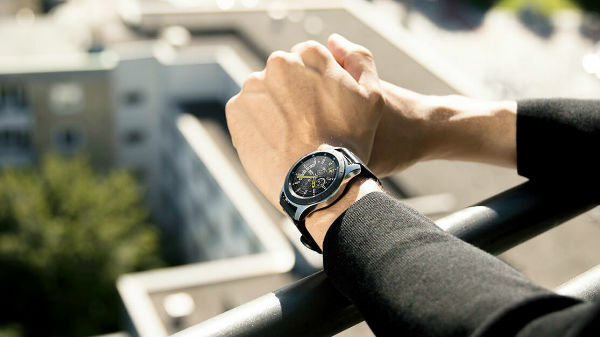 The newly launched products include Fossil Gen 4 Smartwatch Venture HR and Explorist HR, Skagen Falster 2 for Skagen, Michael Kors Access Runway for Michael Kors, Emporio Armani Connected for Emporio Armani, A|X Armani Exchange Connected for Armani Exchange and Diesel Full Guard for Diesel. The new product line comes with features like touchscreen digital display, Bluetooth technology, wireless syncing and magnetic charging, compatibility with iOS 9.3+ and Android 4.4+ (excluding Go edition) and long battery life. It is powered with Wear OS by Google and running Qualcomm Snapdragon Wear 2100 Platform. We got our hands on the Fossil Gen 4 Explorist Smartwatch, which looks quite premium and comes packed with a number of smart sensors. The swim-proof smartwatch has a built-in heart rate tracker, untethered GPS, Wi-Fi and works on Bluetooth 4.1 Low Energy module. Stay tuned for the comprehensive review of the smartwatch on Gizbot.com. Chinese technology company Lenovo has launched "Cardio Plus HX03W" smart band in September this year. The smart band comes with a 0.96-inch OLED full-screen display, embedded heart-rate sensor, long standby time, USB direct charging and water resistance. It is compatible with both Android and iOS, the smart band comes with the running mode, anti-sleep mode, long sitting alert and sedentary reminder features. In addition to that the band is IP68 rated; however, the company advises that users should not take a shower with the watch on the wrist. Riversong has launched a new watch to ensure kid's safety in India. The watch comes 350mAh power backup and it can easily last a few hours. You can also paired up with the smartphone via an app, to monitor the kid's activity. Jelly Kids Watch is priced at Rs. 2499 and is available at Amazon and Flipkart. China-based smart wearable and accessories maker Riversong has launched Wave O2 in June this year. It is a lightweight band that monitors blood pressure and help users track their activities while on-the-go. The band sports a 0.96-inch TFT display with a resolution of 160x80 pixels. It also comes with an IP67 rating which makes it water resistant. Last but not least, we also tested the Xiaomi backed Huami's Amazfit Stratos, which is a multi-sport GPS watch. Priced at Rs. 13,999, the swim-proof smart wearable can track your outdoor runs, measure heart-rate and do a lot more. The smartwatch looks quite premium and offers upto 5 days of battery life which is one-of-the best in the competition. The smartwatch lacks in UI and GPS tracking. Besides, it can show you notifications from your smartphone and even lets you store music on the watch itself. Huami Amazfit Stratos is compatible with iOS and Android and can be a very good budget alternative to pricey Samsung and Apple smartwatches.